The UNCSA Choreographic Institute is an initiative to support the development of new work by emerging and established choreographers of exceptional promise. 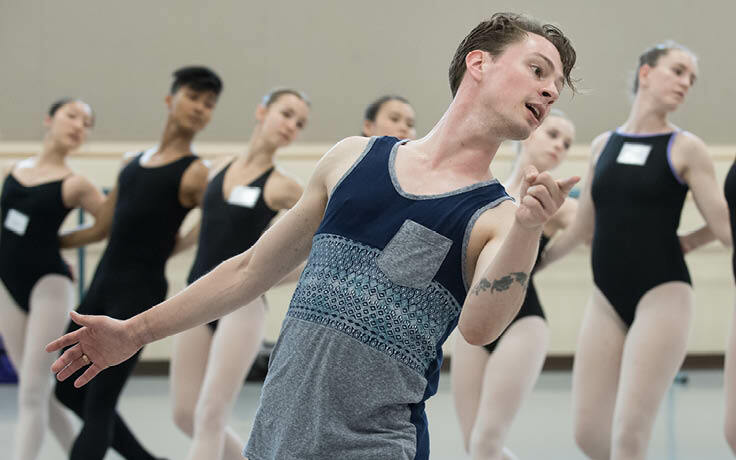 In 2019, emerging and aspiring choreographers can participate in a competitive residency program and a professional workshop in building choreographic skills. Through this initiative, UNCSA School of Dance looks to deepen its mission of developing original works, supporting artists and giving back to the broader community. Choreographic Essentials, created by Helen Pickett, is a unique and immersive dance think-tank initiated in 2011. The workshop is designed to develop, cultivate and expand the compositional / choreographic and performance skill-sets of the participants. The program is geared toward professional and professional aspirant dancers, age 18-27. Learn more about UNCSA's Choreographic Institute through these news stories and features. The School of Dance at UNCSA has announced this year's Choreographic Institute Development Residents. Melissa Bobick, Suzanne Haag, William Isaac and Eryn Renee Young will work with students enrolled in UNCSA's summer dance intensives to create original works. Tony Award-nominated Broadway dance legend Elizabeth Parkinson will lead a two-week Broadway Dance Commercial Lab at UNCSA during Summer Dance, and choreographers Sidra Bell and Victor Quijada will each head a weeklong Professional Studies Intensive.